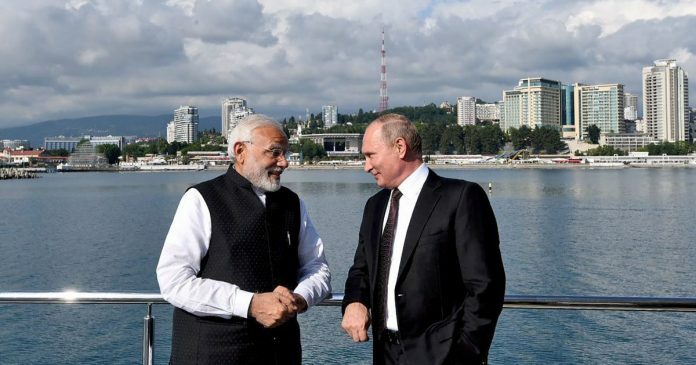 Narendra Modi has described Russia as India’s special friend, but the relationship seems set to enter a difficult patch. Speaking at a public event last weekend, Army Chief General Bipin Rawat stated that India had done a deal with Russia on the S-400 missile system, notwithstanding the threat of US sanctions, because “we follow an independent policy”. General Rawat said that he had conveyed this to Russian officials who were concerned about India moving closer to the United States at a time when the latter had imposed sanctions on Russia, adding that there was “no end in sight” to New Delhi’s cooperation with Moscow. Coming on the heels of Russian President Vladimir Putin’s trip to India, the Army chief’s comments are indicative of the government’s stance on this simmering problem with the United States. Yet, it is also useful to bear in mind the limits of this approach. New Delhi’s stance is entirely understandable from political and military perspectives. The government has maintained that the Countering America’s Adversaries Through Sanctions Act (CAATSA) is domestic US legislation – not international sanctions. The onus is on the Trump administration to exercise the provision for requesting the US Congress for a waiver for India. From India’s standpoint, it is counterproductive to request the administration for such a waiver as it would place India in the invidious position of having to do this for all manner of military transactions with Russia and set a precedent for its dealings with other countries too. Best to stick to the line that India follows an independent foreign policy – one that is not amenable to such attempts at arm-twisting. This also makes sense from a military standpoint owing both to India’s keen interest in the S-400 system (the US has nothing comparable to offer) and the depth of its defence relationship with Russia. The government also appears to draw comfort from the fact that the Trump administration is divided on this issue. The American president himself regards the CAATSA as an attempt to constrain his dealings with Putin. More importantly, the secretaries of defence and state have apparently pushed for a waiver for India. This is not surprising given the broader strategic importance they attach to India. Yet, it is not clear that Trump will oblige. For one, as policy expert Ashley Tellis has argued, Trump is also keen to promote US military exports and India is a significant purchaser. For another, Trump may also regard a waiver as a bargaining chip to extract concessions from India on trade – an issue on which he has been vocal. In so far as sanctions under the CAATSA don’t have to kick in, till such time actual financial transactions for the purchase of S-400 occur, both sides can play a multi-level bargaining game. Whatever the outcome, New Delhi should also take a harder look at its relationship with Russia. Prime Minister Narendra Modi has spoken many times of Russia as a special friend of India. But the reality is that the relationship seems set to enter a difficult patch. At bottom, the problem lies in the all but exclusive focus on military systems and the absence of a larger strategic or economic framework. In consequence, the assumption that there are no limits to India’s defence cooperation with Russia is likely to prove misleading. Although New Delhi’s defence procurement relationship with Moscow dates to the early 1960s, it is easy to forget the broader context that enabled these ties to flourish. The Soviet Union offered India not just a reliable military relationship but also an exclusive one. Given the US-Pakistan military relationship and India’s experience with US military embargoes during the 1948 and 1965 wars with Pakistan, New Delhi could be equally confident of military flows from Moscow and the absence of any such assistance to Pakistan. When Moscow briefly toyed with the idea of military sales to Pakistan in 1968, Prime Minister Indira Gandhi bluntly told her Soviet counterpart that “nothing should be done from which it could be inferred that Soviet Union treated India at par with Pakistan”. The Soviets backed off. This dimension of the relationship also became important vis-à-vis China after the Sino-Soviet military clashes of 1969 and the China-US rapprochement in 1971. In these geopolitical circumstances, the Soviets too appreciated India’s enhanced importance. The importance of this context was evident to Indian policymakers even before the Cold War formally ended. As Mikhail Gorbachev sought to transform Moscow’s relationships with Washington and Beijing, the relationship with India began shrinking. New Delhi was averse to Gorbachev’s proposals for naval disarmament in the Indian Ocean, which were deemed uncongenial to India’s security interests. Moscow, in turn, was unresponsive to India’s pleas against a hasty pull out of the Red Army from Afghanistan – a move that India felt would leave Afghanistan vulnerable to Pakistan-backed Islamist groups. For all the bonhomie with Rajiv Gandhi, Gorbachev thought that “in India, we are faced with a great power policy… India wants everyone to ‘rotate’ around it”. The collapse of the Soviet Union ripped out the strategic frame of the relationship, leaving it running on a single wheel: defence purchases. While this continues to be the prime mover, the wider context has turned less than favourable. As Professor Adam Tooze argues in his fine new book, Crashed, Russia has over the past decade been dealt a one-two punch by the global financial crisis and the sharp downturn in its ties with the West. This has pushed Moscow into a close and dependent relationship with Beijing. It has also led Russia to act in other ways that are problematic for India: the defence sales to Pakistan and the willingness to sup with the Taliban. Given the deep military links between India and Russia, it is evident why New Delhi would like to keep the relationship on an even keel. There is also a lingering hope that ties with India would help Moscow avoid too close an embrace with Beijing. Yet, India has done little to foster a more meaningful overall relationship. Unless there is greater strategic convergence or thicker economic ties, our “independent” foreign policy towards Russia won’t add up to much more than invoices for military purchases. The author is a Senior Fellow at Centre for Policy Research. The only option left is to make our own state of the art weapons like China. A massive R and D effort is required where N.R.Is and even non-Indians are deployed. Collaboration with future powers such as Australia, Canada,Korea and Japan is desired. Brilliant column. Absolutely, from India’s standpoint, it is counterproductive to request the U.S. administration for such a waiver as it would look like a favor requiring and set a precedent for its dealings with other countries too. U.S. must make India immune to CAATSA on its own as a policy and be understanding the line that India follows an independent foreign policy. Many Indians have not realized that Russia today is a shrunken country with only half the GDP of India, and ruled by neo-fascist gangsters. It is no fit friend for India or any other decent country. If India chums up with it the USA will lose trust in India and India will be left to face China alone. The words in parentheses are difficult to believe. But that’s immaterial; if potatoes are available at ten shops we don’t buy them from all just to keep the shopkeepers happy. That way even Israel has some similar system to offer. There is one other thing however that makes me uneasy (because I don’t truly understand these things): there was a news item recently that China has tested a missile that flies at MAC 6, and hopes to beat all missile defense systems by its SHEER SPEED. The article further said that it slows down in its last leg of flight to home in on its target with full precision. So when will our S-400 “catch” such a missile — high up in the sky when it’s hurtling along like nobody’s business, or much later, when it has slowed down and is already “focusing” on use with great precision. It sounds eerie! if China has it, Pakistan too will have it one day. But our own General Rawat is speaking highly of these S-400, so hopefully we are safe. The purchase of military hardware and other strategic material is a durable core that has its continuing relevance. Oil and gas are now – notwithstanding the current phase of disruption and high prices – a buyer’s market. Russia’s non diversified economy leave little scope for anything else. However, Russia, especially under President Putin, is reclaiming its place in the world. It would be good for India to sustain a little warmth in this old friendship. 2. China is extremely important to Russia. Unrealistic to believe India could do anything to weaken their growing friendship. Instead, working together in institutions like SCO, India could use Russia’s good office to improve its own relationship with China. We should not fall in love with the notion that China and Pakistan are destined to remain our mortal enemies for all time to come.